At my request, my first witness – Mr. Owens, took the witness stand. The judge picked an odd moment to show his admiration. Prosecutor Blackquill then spoke. Mr. Owens laughed at my suggestion. Remaining dignified to the end. Mr. Owens's smile became bitter. The look in Mr. Owens's eyes became grim – or at least it looks that way. Mr. Owens gave me a condescending look. It was like he was a different person from his usual gentlemanly persona. This is why I'd lined up my second witness. But I can't be sure if her testimony will expose Mr. Owens's lies. Ms. Rush shouted in a loud voice, her expression just as excited as her words indicated. I spoke to Ms. Rush. Ms. Rush pulled her phone from her bag in a rush, causing her purse, make up pouch and a paperback to fall on the floor, she hastily picked everything up and finally checked her phone. I told Ms. Rush she could leave the stand now (to her great disappointment...), and once again requested testimony from Mr. Owens. The smile had vanished from Mr. Owens's face. The confident smile returned to Mr. Owens's face. ... That's right. Mr. Owens perfectly described the pass case. Prosecutor Blackquill spoke to solidify his stance. I suddenly realised. Mr. Owens nodded in satisfaction and held up his right hand. I recall Mr. Owens awkwardly using his left hand to give me his business card, open doors, etc. Mr. Owens began removing his bandages. Prosecutor Blackquill's tone suddenly became kindly. I'm backed right against the wall. 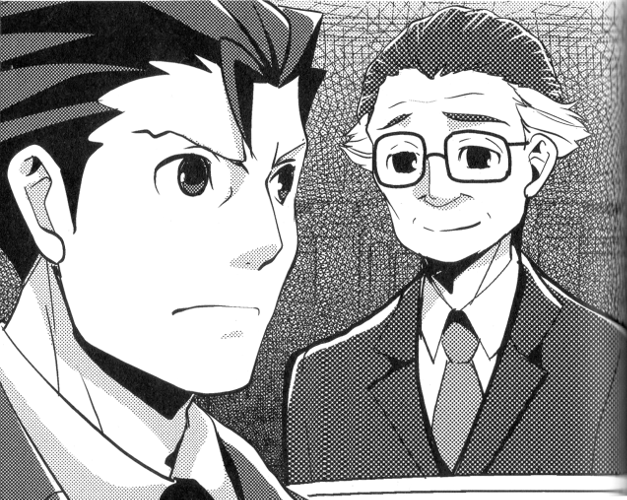 Calm yourself, Phoenix Wright... If Mr. Owens is the culprit, he had to be lying. There has to be a contradiction somewhere in his words. I went back over all the details Mr. Owens had spoken about. The bitter laugh in Mr. Owens's voice returned to my mind. I've got it. That's what's bugging me. Mr. Owens had already made a huge mistake! Mr. Owens took a moment to swallow his breath. Then continued calmly. For the first time, Mr. Owens's expression became flustered. Athena showed her admiration. Luck or not, it's time to push this door all the way open. Mr. Owens went pale. He opened his mouth slightly, but what came out was not his usual smooth voice, but a wordless groaning noise. Mr. Owens immediately realised his error. He promptly cleared his throat and rephrased himself. Mr. Owens had completely regained his calm and once again smiled. 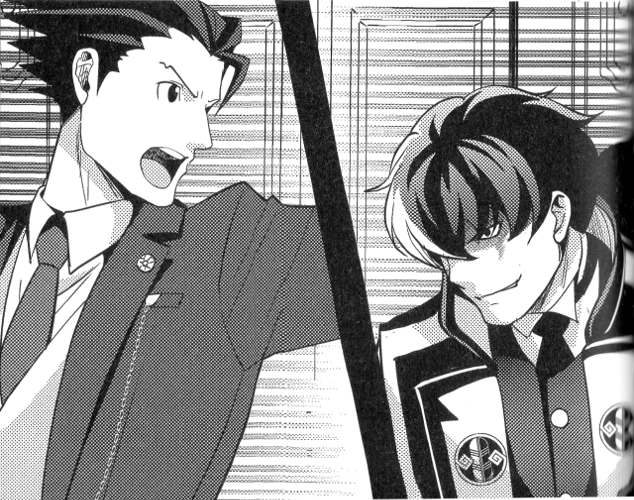 However, Prosecutor Blackquill interjected. Glaring daggers at Mr. Owens. All my doubts turned to convictions. Mr. Owens is definitely suspicious. The judge grasped his gavel. If he brings it down, it's all over. He's about to render judgement on Ms. Cutter...! Owner Owens spoke with a triumphant expression. Prosecutor Blackquill added in. I nodded silently. If Mr. Owens is the culprit, then after committing the crime, he somehow got back to his office on the 17th floor ahead of me. Mr. Owens simply laughed in response to Prosecutor Blackquill. I remained silent. Athena looked at me desperately. Is this the end? Am I really unable to do anything to save Ms. Cutter...? Prosecutor Blackquill gave a sarcastic smile. Mr. Owens also laughed. He was brought back to his senses by Mr. Owens's loud laughing voice. I looked straight at Mr. Owens. Mr. Owens's voice became rougher as he glared at me. Mr. Owens gave up speaking and looked at me with pitiful eyes. A deep voice echoed. Prosecutor Blackquill glared at me with intense bloodlust. I instinctively flinched as Prosecutor Blackquill shouted. I slammed both my hands on my desk and looked at Mr. Owens. Mr. Owens was now irritated. I let out a soft sigh. Mr. Owens turned away, considering the matter settled as he began straightening his ruffled hair. The moment I said that, Mr. Owens's expression changed. It was clear from this expression. We don't even need to check. Mr. Owens's fingerprints will not be found on the pass case. Mr. Owens went as pale as a sheet. His wide open eyes filled with anger. I pointed a finger at Mr. Owens. The courtroom suddenly became quiet enough to hear a pin drop. Nobody moved a muscle. All eyes were on Mr. Owens. Prosecutor Blackquill was silent. The uncomfortable silence focused on Mr. Owens. Mr. Owens began to tremble. His carefully prepared outward appearance of a gentleman crumbled slowly for all to see. Mr. Owens gave me an intense glare as he groaned in a rough voice. 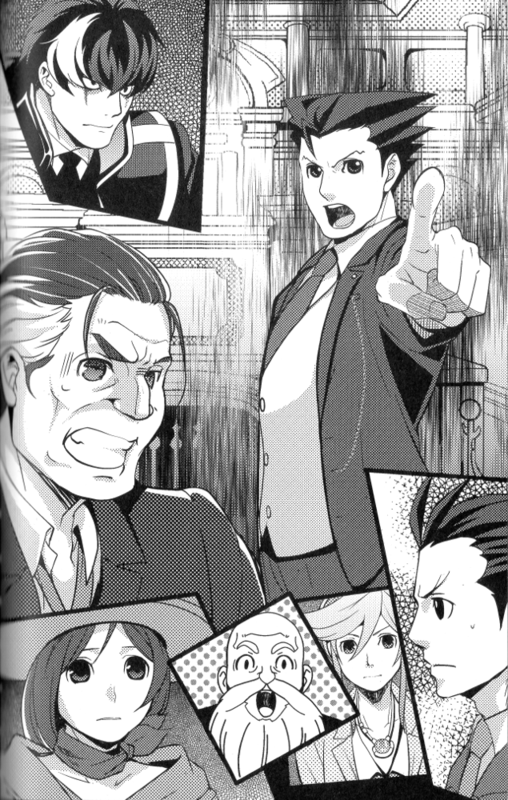 Trucy was the first to stand in the gallery. Ms. Cutter lifted her face, and for the first time, gave a radiant smile befitting an idol.